This big, fluffy dog is sweet and patient, which makes it great for families that have small children. You may recognize this sweet nanny from Peter Pan but they’re also great working dogs and have a great reputation for many different traits. They can be quite large, at just over 2 feet tall, and they have a large bearing to them, but they’re definitely sweet dogs. Newfoundland dogs have a flat and rather coarse coat that could come in gray, black, brown or black and white, which means you’ll find several different looks to this dog. They are each extremely trusting and are highly trainable, which makes them great around children and around the rest of the family. All it takes is a little bit of guidance and they will follow the rules easily enough. Feeding is very important as these dogs are actually quite prone to becoming overweight. That’s why it’s important to feel them high-quality food and to keep track of how much they eat and their overall weight. It’s important to keep treats moderate as well since these can definitely contribute to weight gain. One important factor for these dogs especially is to make sure they are given several small meals rather than large ones as they can be prone to bloat, which can cause the stomach to distend and twist. Avoiding vigorous exercise too close to mealtimes is another important factor in order to reduce the risk of bloat, which can be life-threatening if it occurs. Make sure your dog is getting the right amount of food and the right types of food as well. As you might expect of a dog with quite a large and heavy coat, the Newfoundland dogs need frequent brushing. Going through the coat at least once per week with a long tooth comb and a slick brush will help keep the shedding down, which is another important factor. It also keeps their fur from matting, which can be uncomfortable and also makes it even more difficult to brush them again. When the shedding season kicks up it’s a good idea to brush them every day and keep in mind that spayed or neutered dogs actually shed constantly, which means brushing them out very frequently. You’ll also need to trim their nails regularly and make sure that you’re brushing their teeth regularly as well. 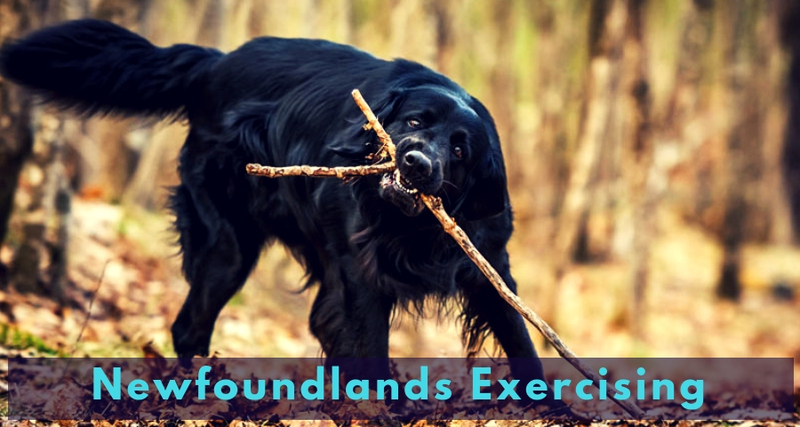 Do Newfoundlands Require A Lot of Exercise? Comfortable as a companion dog or as a working dog, the Newfoundland dog breed needs at least half an hour of moderate exercise each day. This keeps them healthy and helps to prevent obesity. It also makes sure that they stay happy and have plenty of fun. The Newfoundland pups do well outdoors and even in the water, enjoying swimming and long walks. Some seem to think that this dog is quite indoorsy and does well without the exercise, but this is actually not true. This gentle giant will become a couch potato, but that’s not good for them and it’s not something that should be encouraged. Getting out and doing something that requires effort and that gives them a little more fun is definitely going to make them happier and it’s going to improve overall health as well. 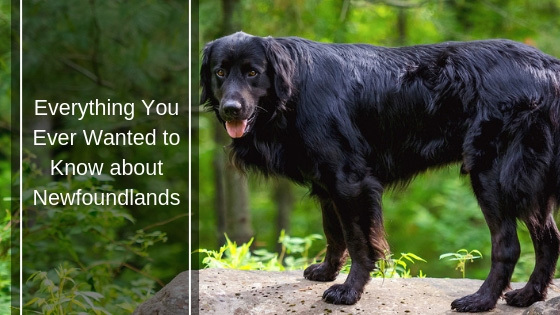 What may seem surprising is that the Newfoundland dog breed actually loves to pull carts as well and enjoy activities that involve agility, herding, tracking, and obedience. Regular exercise is important but these dogs don’t need as much as others. That doesn’t mean they’ll do well sitting around a house all day; however, as that little bit of exercise is definitely important for their overall well-being. Training is actually quite simple with this breed because they really want to be around people. Training and socialization from the time they are quite small can actually help them to become better mannered and makes sure that these large dogs are well-adjusted. If you want them to work in the water this type of training should actually be done quite early. At around 4 months a dog can start the training and they’ll definitely do better in water-based activities as a result of it. Even if you just want them to have fun in the water this could be a good training process. 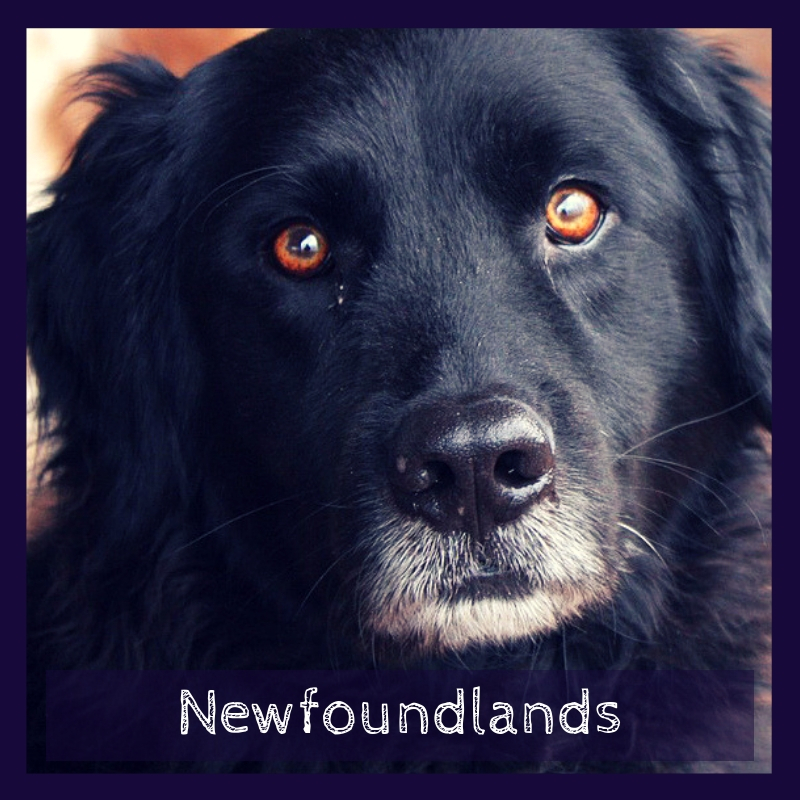 Extremely trusting, you’ll do the best training a Newfoundland with gentle care rather than with harsh methods. They’re extremely outgoing and intelligent, which helps them in the process of training and makes sure that they are calm and complacent. They love the human contact and will do well just being around you. Building their trust is an important way to get them to listen and to train them into obedience as well. For those who need an emotional support dogs, these dogs may seem like the ideal option because they are so friendly and caring as well as loyal, but they can be a bit too much work for some people who need emotional support pets. They are smart, strong, sweet, and very devoted, which means that they can be a great option, as long as you’re able to work with the grooming, the training and the need for outdoor activity. These dogs get a conditional yes as an emotional support animal. Because of the drop ears, it’s important to watch very closely for ear infections and to treat these large dogs as soon as they occur. This requires constant checking. Overall, whether it’s a puppy or an adult dog, you’re getting a great dog that’s sweet and well-mannered. It’s great around children and around other people and they definitely become extremely loyal companions. If you’re looking for a great pet, this is the way to go and if you’re looking for an emotional support animal it’s definitely one to at least consider.